This is part of a week-long Home Decor series for National Sewing Month. Don’t forget to enter the Grand Prize Giveaway! 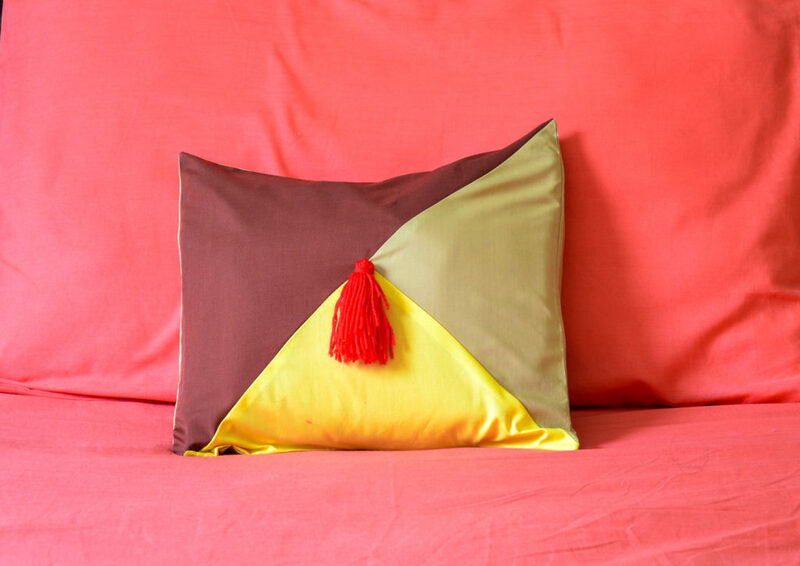 An easy way to add seasonal flair to your living room or bedroom is a great throw pillow. 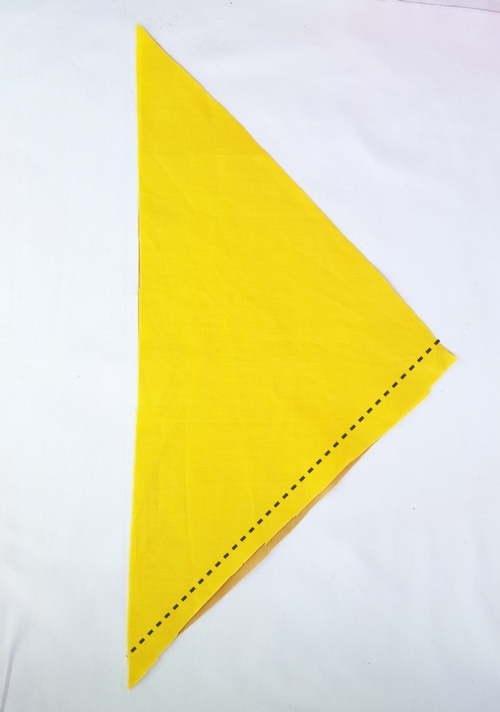 This easy sewing pattern by guest blogger Javeriya from Sew Some Stuff is easy to make, and easy to adapt to your own tastes. Choose autumn colors that complement your space and get decorating! 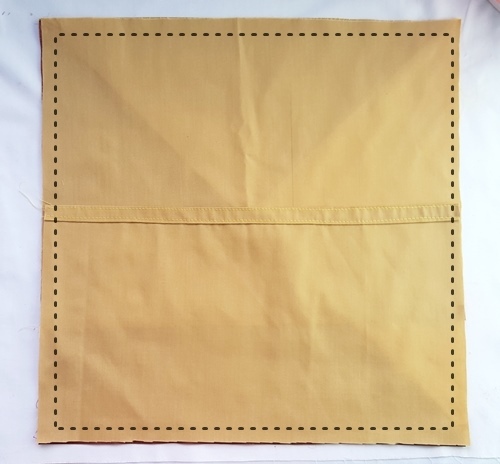 Fold the back beige pieces by 1″ from longer edge and press. 2. 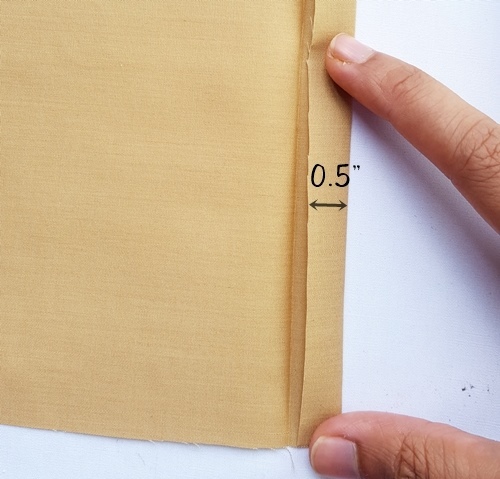 Open the fold, fold again by 0.5″ and press. 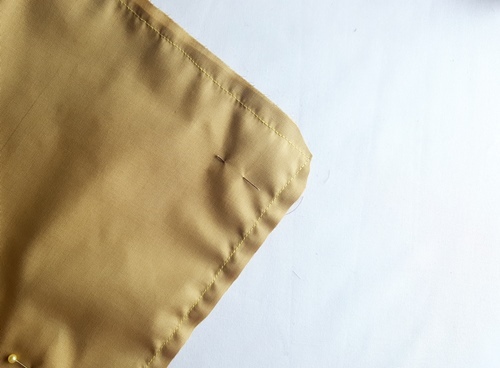 Sew the folded edge. 3. 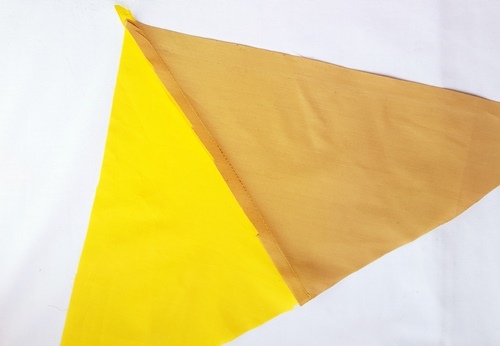 Place the two small triangles right sides together and sew from the shorter edge. Use a seam allowance of 3/8 inch. 5. 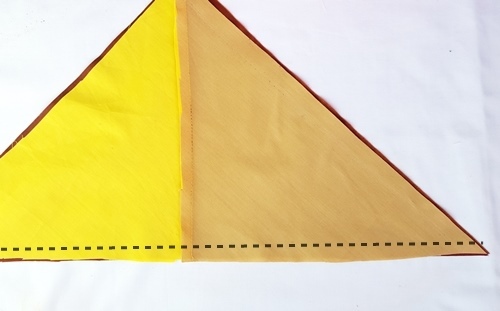 Place this triangle on top of the large brown triangle, right sides together and sew along the longer edge. 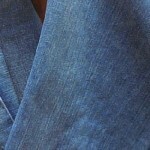 Use a seam allowance of 3/8 inch. Press the seam to one side. 7. 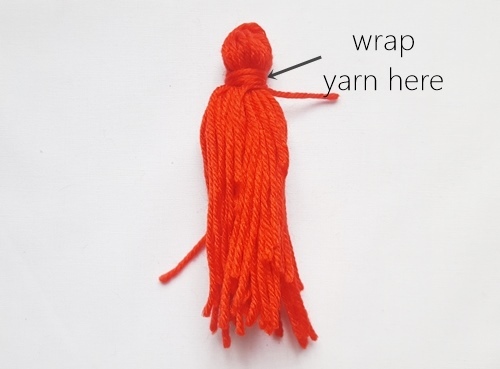 Make the tassel by wrapping yarn around your hand till you are satisfied with the thickness of the tassel. 8. Take it out of your hand and make a cut at the bottom. 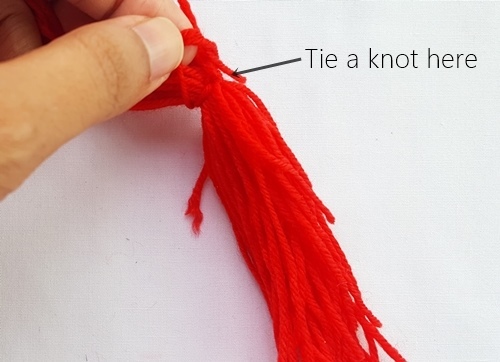 Tie a knot in the middle to hold all the tendrils together. 9. 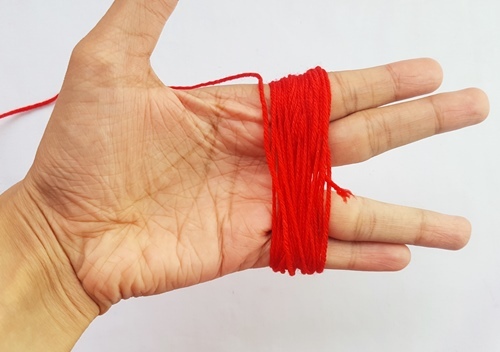 Next, wrap a string of yarn 0.5″ from the top and tie a knot. 10. Hand-stitch the yarn in the middle of the finished front pillow. 11. 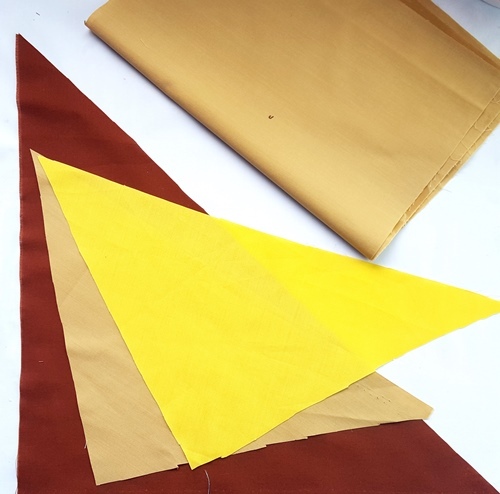 Place the larger beige back piece on top of the front piece so that the right sides are facing each other. 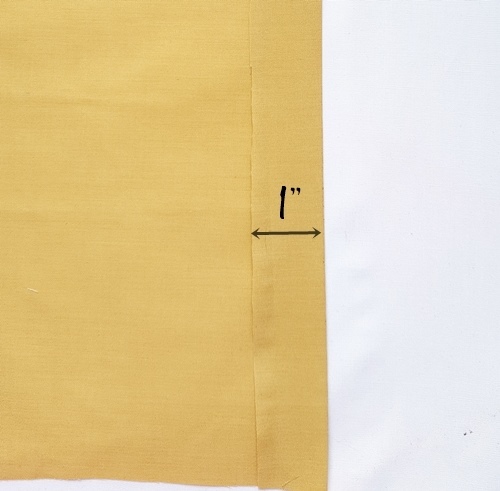 Next, place the smaller beige back piece on top right side down and sew all around as represented by the dotted lines. Clip the corners and turn the right side out. Insert your pillow and you’re done! Today’s Question: What’s your favorite color for fall? 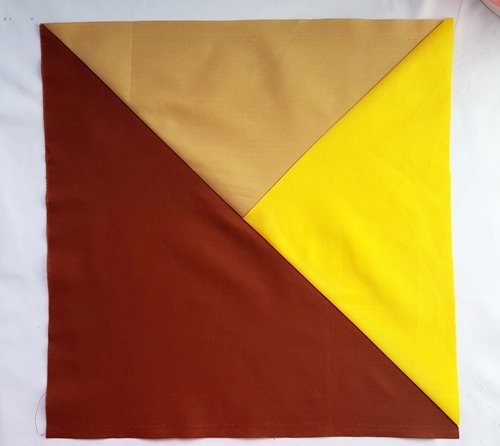 Javeriya is a student blogger who loves to sew and decorate. Pink and glitter are her favorite things! Her blog is called sewsomestuff.com. 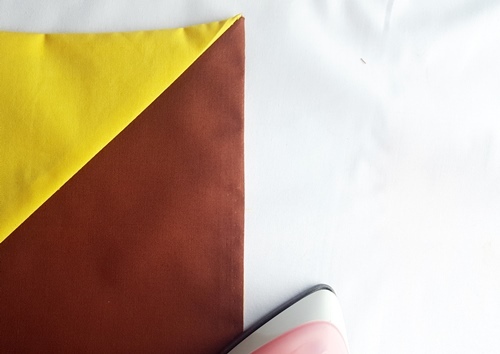 Visit her for super cute and easy sewing tutorials! I like the way all the fall colors complement each other. Difficult to choose just one. My favorite fall color is burgundy. 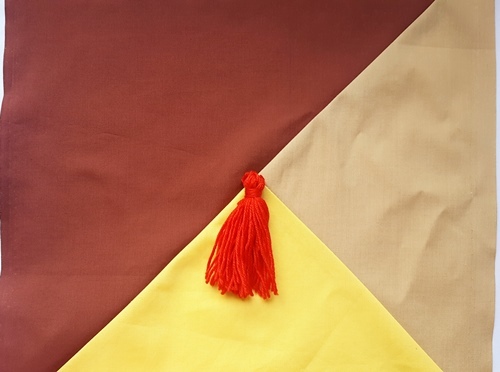 I use a lot of it in my home décor and it seems to coordinate with many other deep colors. To me, it’s pretty all year round! 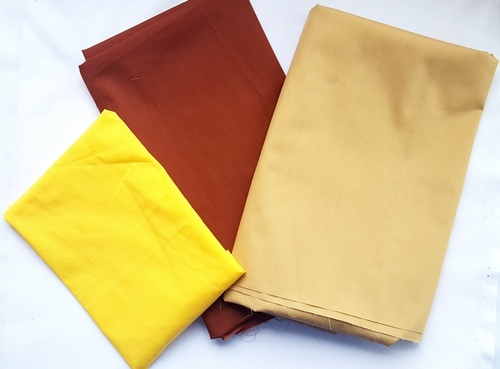 My favorite Autumn color is that shade of yellow is that earthy like fall leaves and sulfur. I agree with “Kathy (never stop learning)” the autumn colors look fabulous because of the combination of colors not just one color in particular. The only choice I could make would be the yellows and oranges. I love a good burnt sienna color for fall! 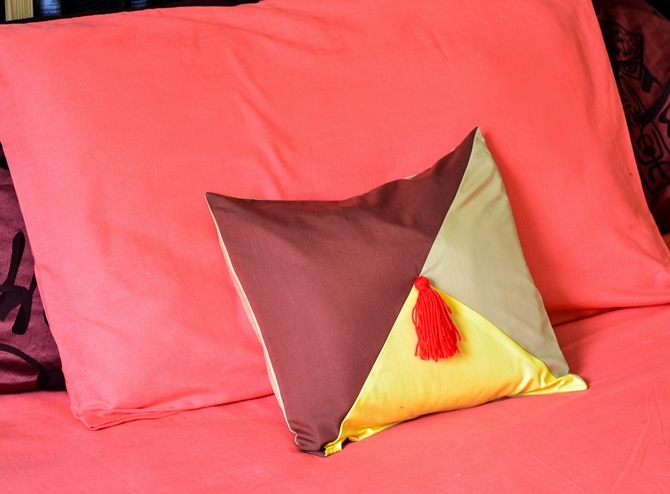 Love how a simple block can make an elegant pillow. The “oranges” are my favorite. Love all the soft shades of fall. Yellows, gold, orange, green and browns. I love all of the fall colors, but especially the orangey-reds. Thanks! There are so many patterns I love to make. I found the Autumn Pillow very interesting, I’ve got scraps of fall material that I can make a couple for my Great Room & I will probably make a couple in Christmas fabric. 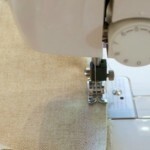 It would be really nice to have that machine to sew my projects on. My favorite color for fall is aubergine, though I really Iike deep reds and oranges too. Thank you for having this great giveaway! I tend to be drawn to burgundy and soft green. I love orange in the fall -reminds me of football time in Tennessee !!! My favorite fall colors are the greens, browns and red leaves. These are the colors that make you realized what a wonderful world we live in! What is meant by my comment awaiting moderation? Thank you! My Fall Color would be a Burnt Red. Orange is certainly my favorite fall color. My favorite autumn color is my favorite all-year color, red. Anything in the red family cheers me up. 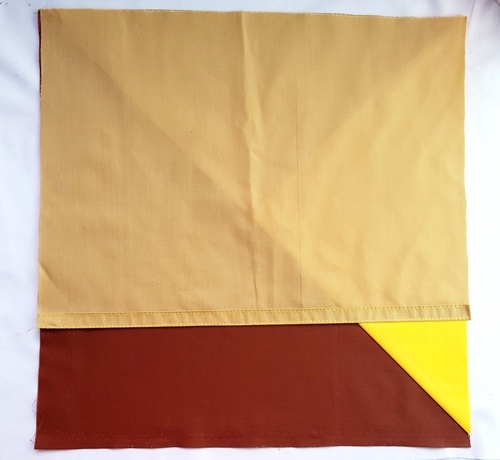 I like brown to be the dominant color with yellows and oranges to complement it. Brown, orange & yellow are my favorite fall colors. Multi-colored leaves make fall beautiful. I like the oranges and yellows. I especially like the crisp air of fall. Sewing season! my favorite color is orange, specifically a refreshing sparkling tangerine. So, it’s smile-making to see so many shades of orange & gold in the autumn. I tend to use the natural friends of autumnal orange, pine green & russet brown in all my crafting. for clothing, I tend to burgundy & crimson. My favorite colors are bright reds, oranges and rust. Love the warm colors of Autumn. My favorite Fall color would be a deep red. i LOVE FALL COLORS. i JUST MADE A QUILT WITH LEAVES, PUMPKINS, SUNFLOWERS AND SCARECROWS. THE COLORS ARE JUST AMAZING. IT WAS DONATED TO A BASKET RAFFLE TO HELP MAKE MONEY FOR A GREAT CAUSE.